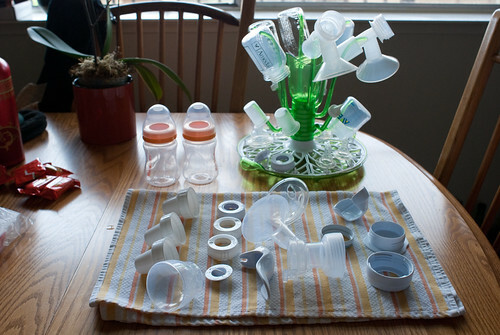 Balancing Jane: Free Breast Pumps For Everyone! I caught part of an NPR story about breast pumps on my way home today. Yummy Mummy, a New York-based boutique shop that caters to breastfeeding women, has had to double its employees, buy warehouse space, and open a call center within the last two weeks. Why? Because breast pumps are now covered free of charge under the Affordable Care Act. As one might imagine, not everyone is happy with this development. The NPR report focused on how the people buying pumps weren't shopping around, but instead going for the most expensive options because they weren't footing the bill. They also reported that some people who had already purchased their own pump out of pocket were buying a second pump because "Why not?" They made it sound a little like women were out buying breast pumps the way they are out buying jewelry. Parenting certainly has status symbols and ridiculous measures of "success" that are based on purchases. When there are strollers that cost considerably more than my first three cars combined, we know that we're dealing with some niche markets that are based on more than just quality. Sometimes brand names are used to make a statement. I certainly think that could happen with breast pumps, but--as someone who used a breast pump every single day for a year--I also know that this is an area where quality matters. A hand pump is not going to cut it if you are needing to pump to provide your baby meals on a consistent basis. When I forgot an important piece of my pump at work one day, I tried to make do with a hand pump and ended up in a tough spot: not enough milk to cover that day's feedings and quite a lot of discomfort. If that had been my primary means of getting milk, there's no way I would have been able to feed my baby exclusively breast milk for the recommended time. I don't know how to explain the way that it feels to not get enough milk while pumping. Until I experienced it, I wouldn't have understood how stressful it feels. Watching those bottles and begging them to fill so that you'll have enough food for daycare the next day is so frustrating. This was especially true for me in the early weeks of breastfeeding. I went back to work when my daughter was seven weeks old. She was still eating every two hours. I was dealing with the emotions of leaving her with strangers for the first time and the guilt of being away from her. Being able to provide milk for her was one way that I felt connected to her even when we were apart; when that ability was put into jeopardy on days when I couldn't produce enough milk, it had profound emotional consequences for me. Sure. I could have supplemented her feeding with formula, and I know that this is the best option for many women and the only option for some women as well. But that wasn't what I wanted to do, and having a pump that worked well was the only way that I could meet that particular goal. If you look at the reviews of different pumps, you can see pretty quickly that there is a difference in performance. The First Years pump, for instance, which is one of the more affordable brands at around $80, gets a lot of negative reviews from women who tried to use it for consistent, daily pumping. Several people talk about how the pump lost suction, had milk back up into the tubing, or had the motor go out. These are not minor problems. If you get milk in the tubing of your breast pump, it can contaminate the whole system. If you lose suction and cannot pump milk during a time when you need milk, not only will you not have the food your baby needs but you could also end up with engorged or infected breasts. Of course, there are still some negative reviews on the more expensive brands (Medela and Ameda, for instance), but there are far fewer complaints than on the less expensive ones. These malfunctions are also why I question the scoffing at the people who are buying a second pump "just in case." While I do think that buying two top-of-the-line pumps is probably unnecessary, this is not a product that you can just not have. If you use a breast pump, then you need a breast pump. If the one you have stops working, then it's not always possible to wait the time to repair or ship or even to buy another one. Finally, the NPR report focused on the fact that there is no such things as a free meal--or a free breast pump. We pay for these "freebies" through our insurance premiums. However, we also pay for the consequences of women not being able to meet their breastfeeding goals. While I think it is every parent's right to formula feed if desired, we can't ignore the fact that formula feeding is often a subsidized act as well. This 2011 article explains that WIC provides almost half of the formula consumed in the U.S. WIC itself recommends breastfeeding and tries to promote it through education and support. A woman interviewed for the NPR report said that she doesn't think having breast pumps will necessarily increase the number of women who breastfeed. However, the CDC and the AMA both note access to a breast pump as one of the contributing factors to breastfeeding success rates. When working outside the home is necessary to sustain a family financially (and that's the case for many, many families), then a breast pump is not a luxury item. It is a necessary tool to help those women meet the nutritional and health needs of their families. Finally, breastfeeding has been found to reduce a wide range of diseases, including asthma, type 2 diabetes, respiratory disease, and ear infections. If the concern is about the financial costs of health care, can't we see than an ounce of prevention is worth a pound of cure? I, for one, was thrilled by this news. I remember well the cringing moment when I first saw the price tag on a double electric breast pump. But manual pumps are a joke for full-time working moms. I am now awaiting the day when insurance will cover midwifery.